Video clip synopsis – Producer and director Oliver Howes reflects on French Polynesia's colonial history. Broadband MP4 challenge_bb.mp4 (16.2MB), suitable for iPods and computer downloads. This interview with Oliver Howes was recorded for the Pacific Stories website produced in 2005. 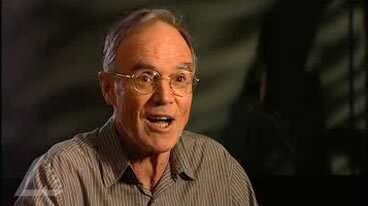 Oliver Howes joined Film Australia in the late 1960s and worked on both fiction and documentary projects. He directed the first Papuan New Guinea feature film and his documentaries have covered a wide spectrum of issues in Aboriginal Australia, Fiji, Tahiti and Japan. He now works as an independent writer and director and his short video dramas have won awards in Australia and the US. Pacific Stories is a co-production between Film Australia’s National Interest Program and the Australian Broadcasting Corporation. Presented by Vika and Linda Bull, the project explores the geography, history and culture of the South Pacific. This clip and associated activities gives students the opportunity to learn about the fundamental concepts of the course and about key concepts such as continuity, change, values, tradition, westernisation, beliefs, identity, modernisation and empowerment. is all change necessarily progress in Tahiti? are westernisation, modernisation and industrialisation inevitable in Tahiti? This material is an extract. Teachers and students should consult the Board of Studies website for more information. In this video clip Oliver Howes, producer and director of the documentary A Place of Power in French Polynesia, talks about French Polynesia’s colonial history, its emerging nationalism and the cultural response to colonialism which had robbed the nation of its way of life. He also speaks of Tahitian poet Henri Hiro. Howes explains why his film focuses on cultural revival and on the views of ‘elite’ Tahitians. In 1843, France established a protectorate over Tahiti and the neighbouring island of Moorea and in 1880 it extended its rule to the remaining island groups. In 1957 the area became known as the overseas territory of French Polynesia. Life changed more rapidly for the colonised Tahitians with the opening of an international airport in 1960 and with the installation in 1963 of the Centre for Nuclear Experiment in the Pacific (CEP). The Cold War brought on the race to develop effective nuclear weapons. Testing nuclear weapons was done where people were few and powerless: the Russians tested in Central Asia; the Americans used atolls in the Marshall Islands (as well as the Nevada desert); the British used Christmas and Malden Islands as well as outback South Australia; and the French tested in the Sahara and then used Moruroa and Fangataufa atolls in French Polynesia. Testing of nuclear bombs from 1966 to 1996 and the associated military spending turned French Polynesia into a nuclear dependency of metropolitan France. Before the colonial era, Tahitians lived in a subsistence economy; this changed under colonial rule. ManyTahitians were employed by the French military or found work in the tourist industry. Rapid urbanisation saw people leave rural areas to seek work in town where they came to depend more and more on French products, such as imported food. The territory produced approximately 25 per cent of its food in the early 1990s; it had been self-sufficient in the 1950s. From the 1960s Tahiti’s economy was an artificial economy reliant on subsidies and patronage from France. The French stopped nuclear testing in 1996 and military spending was reduced, impacting again on the Tahitian economy which had become dependent over the years on French military spending. Today, under certain acts of France, French Polynesia has acquired autonomy in all areas except those relating to police and justice, monetary policy, tertiary education, immigration, and defense and foreign affairs. It is still heavily reliant economically on France and heavily influenced by French language and culture. One of the desired outcomes of the Society and Culture course is that students evaluate continuity and change and assess social futures and strategies for change and the implications for societies and cultures. What insights into continuity and change in Tahiti did you ‘glean’ from the Oliver Howes interview? How important a role, according to Howes, does Henri Hiro play in changing Tahitian society? What strategies for change does Hiro employ? What implications are there for the social futures of Tahitians because of the westernisation of their economy? To what extent, do you consider – did the French think about the future of the Tahitians when they set up the Centre for Nuclear Experiment in the Pacific? Go to Pacific Stories Learning for Interactive Compass Map with facts about the Pacific region. For interview transcripts, books and references for this Digital Resource go to Pacific Stories, choose A Place of Power in French Polynesia, select INDEX, and go to MORE INFORMATION.